Banda Rossa has always been the pride of the Giuseppe Giusti balsamic vinegars, from the family's precious reserve. A limited quantity, born from the most precious grapes, drawn from the most precious barrels of the Acetaia, dating back to the 1600-1700's & released only after extensive aging! 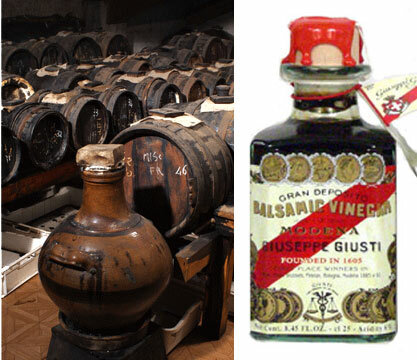 Giusti is the oldest & most prestigious producer of balsamic vinegar of Modena, Italy, established in 1605. Giuseppe Giusti Banda Rossa balsamic vinegar draws aromas & flavors already created centuries ago. The result is an irresistible mellow balsamic vinegar with a superb aroma & fruity notes, which make this a unique balsamic. Use a few drops on fresh fruit, on a piece of aged Parmesan cheese, on vanilla ice cream, or a few drops in sparkling water as an aperitif. Guisti was awarded 14 gold medals during famous exhibitions in 1861 in Florence, 1889 & 1900, in Paris & the Royal Seal of Approval in 1929. Giuseppe Giusti Banda Rossa Balsamic Vinegar.